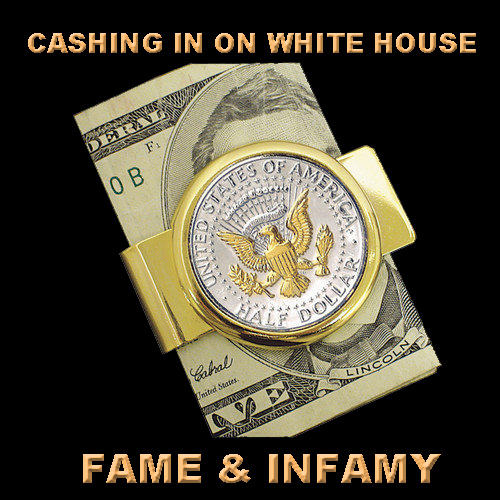 BILLARY CLINTON CASHING IN ON WHITE HOUSE FAME (AND INFAMY) – TRUTH IN MEDIA: TRUTH TRUMPS POWER EVERY TIME! 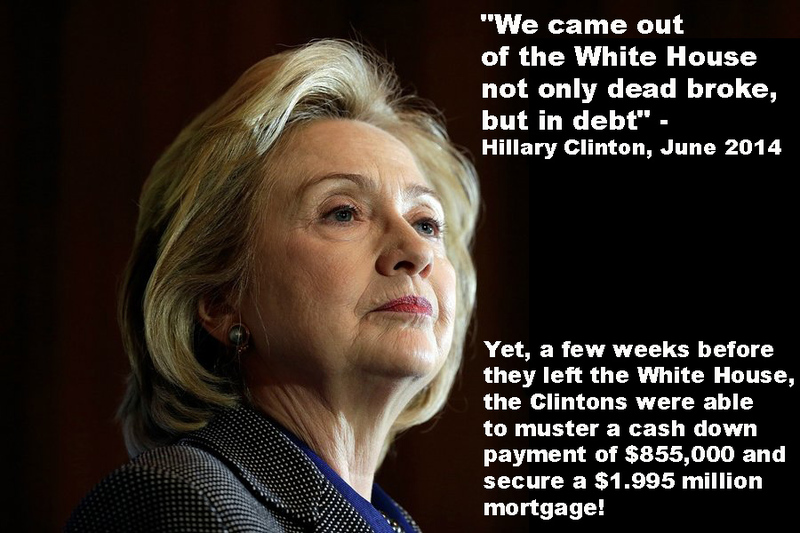 “We came out of the White House not only dead broke, but in debt,” Hillary Clinton told ABC in an interview on June 9 of last year. Yet a few weeks before they left the White House, the Clintons were able to muster a cash down payment of $855,000 and secure a $1.995 million mortgage – from Citibank, possibly the most egregious influence peddler of all big Wall Street banks (see Sen. Elizabeth Warren’s remarks below). Which makes Hillary’s “dead broke” claim suspect, if not dead false. Either way, the Clintons are now raking it in, cashing in on their fame or infamy, as many Americans may prefer to think of their eight years at the White House. Hilary Clinton and former president Bill Clinton earned in excess of $25 million for delivering 104 speeches since the beginning of 2014, new financial filings revealed. The financial revelations came when the Clintons filed required income statements from January 2014 onward with the Federal Election Commission on Friday, and reported by The Washington Post. Bill Clinton out did himself when he took in $500,000 in one day by collecting $250,000 each for lectures at Univision and Apollo Management Holdings (Vanity Fair story, May 16, 2015). Not bad for a day’s work – if you can get it. The filing also revealed that as the Clintons’ political capital grew over time, as did they speaking fees. 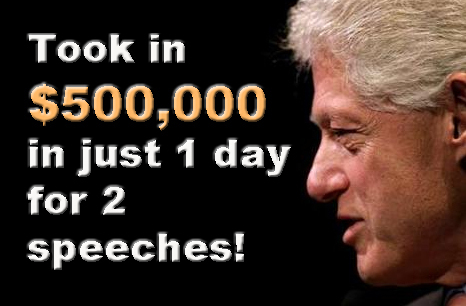 During Clinton’s 11 years as a U.S. senator, and then as President Obama’s secretary of state, according to The Washington Post, Bill Clinton made $105 million for 540 speeches, for an average of just (or rather “just”) $194,444 per speech. In 2012, Hillary Clinton reported that her husband earned more than $16.3 million for 72 speeches, or an average of over $226,000 per speech. For those without a calculator handy, their latest $25 million since 2014 for 104 speeches breaks down to an average of over $240,000 per speech. Who says that infamy doesn’t pay? Just like Napoleon rewarded his marshals and generals with gold and lavish homes around Arc de Triomphe in Paris even though they had had their butts kicked out of Russia. Just look at Monica Lewinsky, the Clintons’ co-creator in White House infamy. This perjurer is also now giving speeches trying to portray herself as a victim of social media. THIS WRITER’S FB COMMENT – APR 6, 2015: Monica Lewinsky paints herself as a VICTIM of social media!? Oh, please… That’s an insult to one’s intelligence. She now claims to have “fallen in love” with a known womanizer, a married sleaze-bag, with whom Lewinsky claims to have had sexual encounters nine times, including seven times when Clinton’s wife was at the White House. Lewinsky then proceeded to LIE IN A SWORN AFFIDAVIT about it. 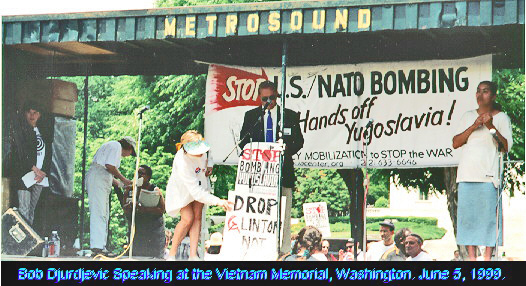 It was only when her friend Linda Tripp discovered in January 1998 that Lewinsky had sworn an affidavit in the Paula Jones case denying a relationship with Clinton, that Tripp decided to deliver the tapes of her conversations with Lewinsky to Kenneth Starr, the Independent Counsel who was investigating Clinton on a slew of other scandals and controversies. That’s the TRUTH about “this woman.” Like everyone else, she deserves forgiveness and compassion. But no amount of her PR efforts and public rhetoric 17 years later can alter those FACTS about her. 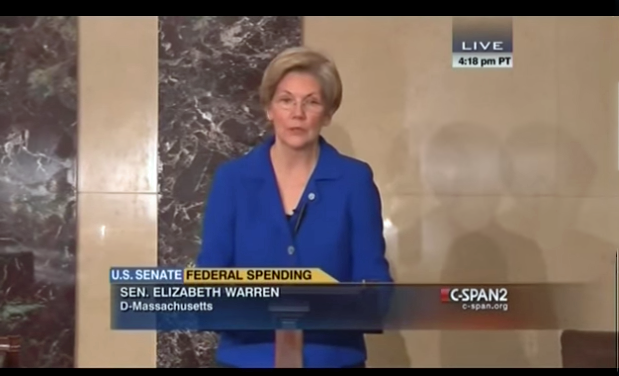 Citigroup has also spent millions trying to influence the political process in ways that are far more subtle—and hidden from public view — Sen. Elizabeth Warren (D-Mass), on Senate floor – Dec 14, 2014. She also said that Citicorp “has risen above the others” among big Wall Street institutions in trying to influence the White House decisions. The U.S. Trade Representative and the person nominated to be his deputy – who is currently an assistant secretary at Treasury – are Citigroup alums. A recent chairman of the National Economic Council at the White House was a Citigroup alum. Another recent Chairman of the Office of Management of Budget and Management is also a Citi alum — but I’m double counting here because now he’s the Secretary of the Treasury. And lest we forget, Citigroup’s heritage includes the Rockefellers, the Big Cheeses of the New World Order banksters. In 1952, James Stillman Rockefeller was elected president and then chairman in 1959, serving until 1967. Stillman was a direct descendant of the Rockefeller family through the William Rockefeller (the brother ofJohn D.) branch. In 1960, his second cousin, David Rockefeller, became president of Chase Manhattan Bank, National City’s long-time New York rival for dominance in the banking industry in the United States. We live in an era of greed and plutocracy. That’s nothing new, of course. But things are getting worse for all but the top echelon of the New World Order. “Having it all and wanting more”, reads the headline of the Oxfam report released today. 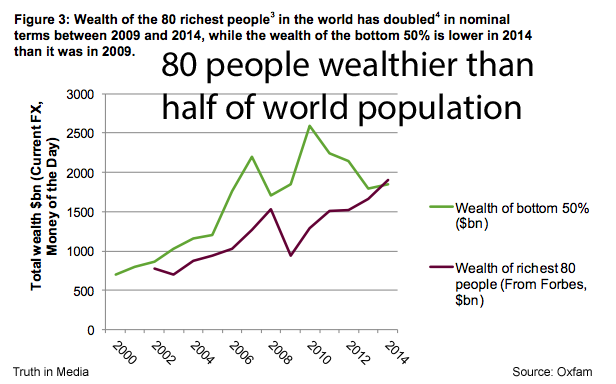 “Global wealth is increasingly being concentrated in the hands of a small wealthy elite,” Oxfam notes. The top 1% have about as much wealth as the bottom half. By 2016, they will have more than 50% of the global wealth, Oxfam predicts using the current trends. It was quite amusing to see Obama, who betrayed the trust the American people put in him, is now trying to suddenly coddle up to the electorate. The White House announced yesterday that Obama aims to raise more than $300 billion in taxes by imposing a new levy on the the largest financial institutions, raising the top rate of capital gains tax to 28%, and closing a loophole that lets wealthy families pass down assets without paying tax. Why do I that amusing? Because talk is cheap. We should follow the money. And if we do that, we will find that during the first six years of Obama’s presidency, the rich got richer and the poor got poorer – WORLDWIDE – not just in the United States, according to Oxfam. Which makes Obama an even more subservient Wall Street minion than was GW Bush (above chart). Another indicator of how much of a Wall Street lapdog Obama has been is that the wealth of the 80 richest people in the world has doubled in between 2009 and 2014, while the wealth of the bottom 50% was lower in 2014 than it was in 2009. Pingback: WHITE HOUSE FOR SALE: ASKING $5 BILLION – TRUTH IN MEDIA: TRUTH TRUMPS POWER EVERY TIME!